Whether it's a new home, an existing carport or you simply want a new garage door, we can provide the ideal garage door for you and your budget. We provide servicing and maintenance for all types of garage doors at the most competitive prices. When was your garage door last serviced? Garage door repairs, help and advice. If it needs fixing, refurbishment or replacement we can offer the most cost effective and practical solution. We are an AGDA approved, independent garage door repair, maintenance and installation company serving Perth's northern suburbs. We are based in Butler and provide a fast, friendly, efficient service to the surrounding suburbs. With lower overheads than the larger garage door companies and wealth of experience and technical knowledge, we are able to offer big savings over our competitors. We stock a wide range of spares and accessories for all major garage door brands and if we don't have it, we can get it or suggest a cost effective replacement. Trust us to get the job done! Which Suburbs Do We Service? We provide garage door servicing to Butler, Clarkson, Jindalee, Merriwa, Mindarie, Quinns Rocks, Ridgewood, Kinross, Joondalup, Alkimos, Allara, Amberton, Shorehaven, Eden Beach, Jindee, Jindowie, Neerabup, Two Rocks, Yanchep, Carramar, Currambine, Eglington, Carabooda, Nowergup, Banksia Grove, Ashby, Tapping, Wanneroo, Lansdale, Iluka, Burns Beach and more. 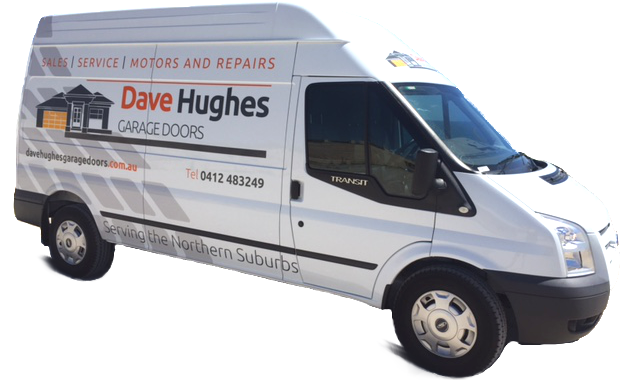 From a damaged door to a lost garage door remote control, Dave Hughes Garage Doors can help. We can provide friendly, informed advice and no obligation quotations for repair or replacement of garage door: REMOTE CONTROLS, MOTORS, TRACKS, RAILS, WIRES, OPENERS, HANDLES, SPRINGS, DOORS and garage door BALANCING, SERVICING, SALES, INSTALLATION, MAINTENANCE and more.